It has been a very stressful day at work today and to cheer me up, I decided to take a shopping trip after work. While wondering aimless around Sydney CBD, I stumbled across this pink suit jacket. I immediately fell in love and when I tried it on, it fitted me like a glove. It truly looks and feels amazing. I ended up buying it. 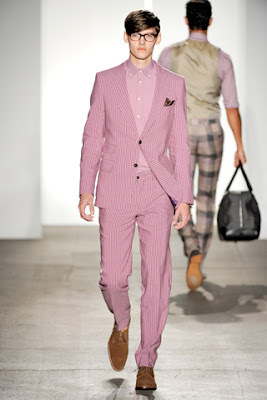 I always wanted a pink suit jacket ever since I saw Tom Ford's Spring Summer 2010 collection. Of course buying a Tom Ford jacket is not an option for me, primarily because of the price. He again featured several in his Spring Summer 2011 collection. Since that collection more and more designers chose to feature pink suit jackets or full suits at their runways. Even Chuck Bass, whose fashion sense I admire wore one in one of the Gossip Girl episodes. I know that this pink suit jacket is not an easy piece to wear. My suggestion is to wear only the jacket unless you look like a model. 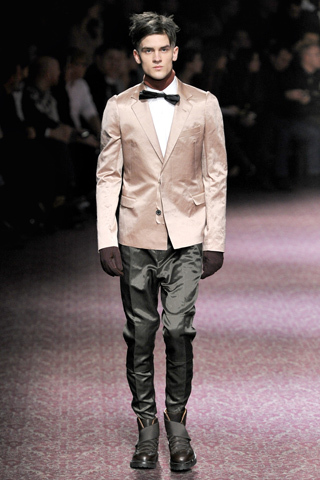 I particularly like how Tom Ford wore his in the picture below. I think the next time I get the opportunity to wear this, I will want to look like him. It is elegant but not conventional. Perhaps for day time, I could also lose the bow tie, undo the top few buttons and wear a corsage instead on the lapel of the jacket. That just makes it a bit more casual. this fashion is to die for. i truly admire the sophisticated undertones captured within this elegant piece. Everyone was not positive when I thought of wearing a silver shining suit. Obviously you should have demonstrated an example by wearing this on casual Friday at work.